adam&eve DDB had a great Christmas campaign for us to work on. We were asked to create a 3D CGI jumper for Save the Children. The material needed to feel like a warm and soft Christmas sweater. In order to achieve this we created an extremely complicated model to get the right effect. This meant we needed to model each fibre of the woollen material and every link of the knitted sweater to give it the right texture. adam&eve DDB were on hand to help design the layout and we created 10 different and bespoke layouts for all the various media sizes and ratios required. Normally this would be a simple case of cropping the image to the different sizes, but that means crucial design elements are always lost. Being a CGI model, we can adjust the model for each layout so that the advert is correct for each different aspect ratio and each has the correct design elements. Save the Children is a great charity and this was a great promotion we are proud to be part of. 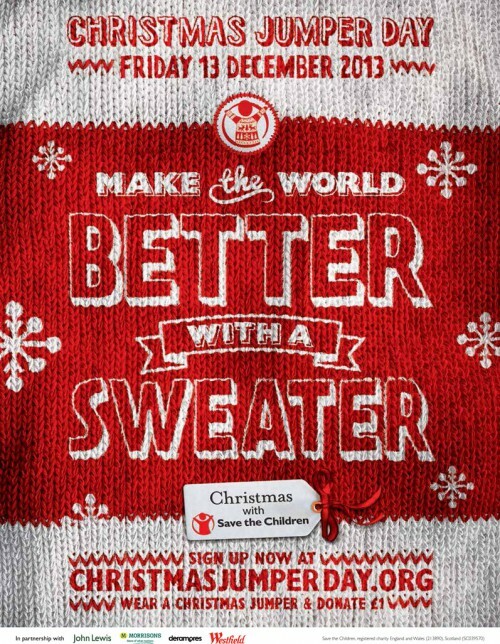 So why not wrap up warm this Christmas with a Christmas sweater and donate to a great cause? You can find out more and sign up here. www.savethechildren.org.uk.